N – connection to earth via the supply network. In a TN system, the integrity of the earthing of the installation depends on the realiable and effective connection of the PEN or PE conductor to Earth. The neutral point or the midpoint of the power suplly system shall be earthed. Each exposed-conductive-part of the installation shall be connected by protective conductor to the main earthing terminal of the instalation, which shall be connected to Earth. TN-C – A combined PEN conductor fulfills the functions of both a PE and an N conductor. The combined PEN conductor typically occurs between the substation and the entry point into the building, whereas within the building separate PE and N conductors are used. 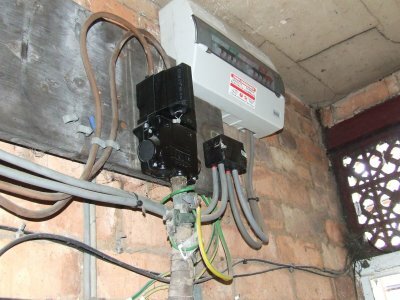 In the UK, this system is also known as protective multiple earthing (PME) , because of the practice of connecting the combined neutral-and-earth conductor to real earth at many locations, to reduce the risk of broken neutrals – with a similar system in Australia being designated as multiple earthed neutral (MEN) . TN-C-S – Part of the system uses a combined PEN conductor, which is at some point split up into separate PE and N lines. In a TT system, every exposed-conductive-part which is to be protected by a single protective device shall be connected, via the main earthing terminal, to a common earth electrode. However, if to or more protective devices are in series, the exposed-conductive-part may be connected to separate earth electrode corresponding to each protective device. In an IT system, live parts shall be insulated from Earth or connected to Earth through a sufficiently high impedance. This connection may be made either at the neutral point or midpoint of the system, or at an artificial neutral point. The latter may be connected directly to Earth if the resulting impedance to Earth is sufficiently high at the system frequency. Where no neutral point or midpoint exist, a line conductor may be connected to Earth through a high impedance. The most common types of supply available in the UK are TN-S, TN-C-S and TT. But, how to recognize an earthing system at my home? Simply search for a service cut out and see how it looks. Previous Previous post: How to wire power factor correction. Next Next post: All you need to know about DOL starter.